As we grow older, more and more health problems start appearing and affecting us. One of the organs which deteriorate with age are our eyes, since they become less flexible and generally weaker. Namely, we are likely to face blurry vision and other vision problems due to these changes. Presbyopia, or inability to see near objects properly, is one of the most common vision disorders people can suffer from. Nevertheless, there are numerous other conditions which affect our vision. Therefore, as we age, we need to keep these diseases in mind and take good care of our vision by paying our doctor regular visits. Age-related macular degeneration is also considered to be one of the most common conditions affecting your eyes at an older age. In fact, this phenomenon is the main reason behind blindness in old age. Blurry or distorted vision, along with lines and dark spots present in the picture your receive through the eyes, are all signs of AMD. This condition is caused by damage done to the cells in the macula, triggering central vision loss. Thus, people with AMD are capable of seeing normally as far as peripheral vision is concerned. Alternatively, many older people suffer from glaucoma, making it one of the most frequently seen eye problems on the planet. Glaucoma takes place once the optic nerve gets damaged due to increased pressure within the eye. This kind of abnormal pressure leads to deterioration of the optic nerve and the optic disks, causing complete vision loss when neglected. Due to the fact that older people have thicker corneas, they have increased chances of suffering from this eye disease. Again, timely diagnosis and treatment can lead to successful recovery. Typically, laser surgery and therapy are treatments for patients with glaucoma. Notorious for its manifestations and characteristics, cataract is considered to be the age-related eye disease most people know about. 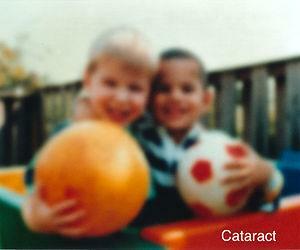 This condition manifests through clouding of the eye, resulting in blurred vision and, gradually, complete blindness. Once the clouding affects smaller portions of the eye, vision is usually not affected. However, when it spreads over a large surface of the eyes, the blurry vision may become predominant. Thus, as soon as you notice any such vision changes, seek medical assistance immediately. Finally, old age can bring numerous particles which can be seen in our vision. These phenomena, known as floaters, appear due to changes in the jelly-like substance our eyeballs are made of. Thus, as fibers inside this substance change, we may experience spots, lines or other such floaters, interfering with our clear vision. Purple bumps that leave marks, blurry vision and groin pain.